When the little one asked me about making the cookies this last time, I responded with "What kind?" After a few minutes of "Ummm..." I brought up the butter cookies and sugar cookies we've made before. Both sounded good, but we thought it was time for something new. For some reason, the lemons sitting on the table popped into my head so I thought I'd take the sugar cookie theme and reinvent them into lemon cookies. 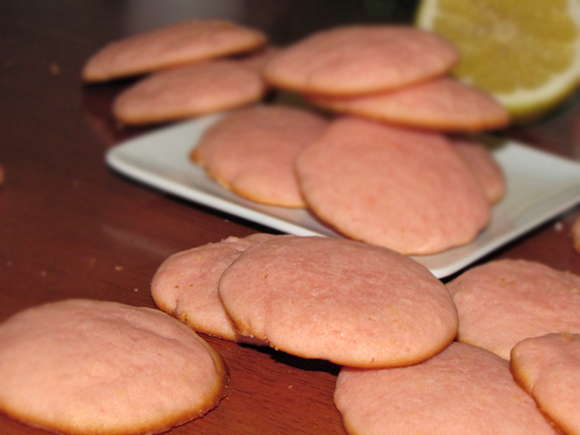 No wait...lemonade cookies. And then I thought I'd get a little more inventive and use the packet of pink lemonade Kool-Aid that was sitting in a draw for who knows how long to come up with pink lemonade cookies. How fun, right? 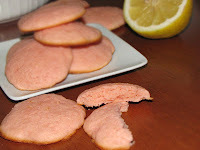 Unfortunately, I found out that my lemonade cookies weren't such an original idea. (Is anything really anymore?) I found a couple recipes that used a can of lemonade concentrate, but that's not really my thing. Instead, I did the 'use what I have on hand' thing and made up my own version. They're sweet, but tangy. Tart, but fresh. Cake-like, but not spongy. They're so different than anything I've tasted and it was a nice change from the standard cookie batches. I wasn't sure how my son would react since he isn't big on lemon-flavored food, but he loves lemonade so it couldn't be that bad, right? He ate one then said in his little, almost patronizing, 3 year old voice, "Not bad!" I just had to laugh. He then ate another one and said, "I loooove these cookies!" I guess he sure knows how to make his mama happy! 2. Beat butter and sugar in large bowl until fluffy. 3. Stir in eggs, lemon juice and optional food coloring until all is incorporated. 4. Combine flour, baking soda, salt and Kool-Aid in medium-sized bowl. 5. Add flour mixture to egg mixture, stirring to combine. Don't overmix. 6. Drop by spoonfuls onto parchment (or foil-lined baking sheet sprayed lightly with non-stick spray). 7. Bake for 7-9 minutes or until bottoms are golden brown. 8. Let cool on baking sheet for a few minutes then transfer to wire rack to cool completely.